Adelaide - Ricky Ponting has the unanimous backing of selectors as he searches for runs to save his Test career and will play in the series decider against South Africa, coach Mickey Arthur said on Tuesday. The former Australia skipper, who turns 38 next month, has failed in three innings against the Proteas during draws in Brisbane and Adelaide and pressure is building on the 167-Test veteran ahead of Friday's third Test in Perth. Ponting admitted in Adelaide that he was a realist and knew that if he did not start scoring runs then he "definitely" would not be in England for the Ashes in July and August next year. Arthur, who is also on the selection panel, told reporters that Ponting's future had not been discussed by selectors. "We unanimously back Ricky Ponting to get us some runs. By his own admission Perth is a big test for him, but Ricky has prepared brilliantly, he's really given us everything we could probably have asked," Arthur said. "He'll leave no stone unturned in his preparation for Perth and I'm backing him for a big score in Perth, no doubt about that." "Inside the dressing room and privately we've all backed Ricky Ponting," he added. "If Ricky's scoring runs then we definitely want him around for the next six months. 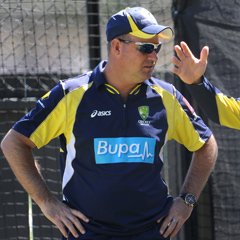 We want Ricky Ponting to go to the Ashes, there's no doubt about that." Ponting has spoken in the past about his burning motivation to keep on playing after leading Australia to back-to-back Ashes series defeats before Michael Clarke took over the captaincy. Skipper Clarke has called for calm heads about the future of Australia's top Test run-scorer, who is behind only India's Sachin Tendulkar on the all-time Test list, with 13 366 runs. "The one thing we need to keep in mind was he was the leading run-scorer in Sheffield Shield cricket leading up to the start of this (Test) summer, so he is batting well," Clarke said. "We can all get out early in our innings, every single one of us. Once he gets in I have no doubt at all he will go on and make a big score, he knows how to make big hundreds." Arthur also hinted that unpredictable paceman Mitchell Johnson is in line to bowl in Perth after he was one of three fresh fast bowlers named in a 14-man squad amid doubts over pace pair Peter Siddle and Ben Hilfenhaus following Monday's bowling exertions in the draining Adelaide Test. "I thought Mitchell was outstanding for us in the one-day series against Pakistan. He bowled superbly and arguably was one of our best bowlers there during that one-day series," Arthur said. "These two guys (Siddle and Hilfenhaus) gave it their all on the last day of the Adelaide Test and we can look how everyone comes up and we can make a really concerted and good decision for Friday." Arthur said it was possible that both Siddle and Hilfenhaus would not play in Perth given their tiredness after bowling for the last day and a half in the heat at Adelaide. "We've got a couple of days and I can't see them bowling any balls at training so we've just got to see how they pull up, hence we've given ourselves the cover in case they don't pull up well," he said. "We're in a position where we could go in with a totally different attack in Perth."